Home > Residential Metal Roofing > Building A New House? So you’re planning to build your dream house! And you want a roof with a beautiful and permanent American Metal Roof. Excellent choice! You’ll enjoy decades of maintenance-free beauty while lowering home energy costs and keeping your home dry and comfortable. Now, here’s the big question: Just how much does an American Metal Roof cost? Based on where you are at in the process, here’s how to figure the estimated cost of a new American Metal Roof into your planning budget. Early Planning Phase – If you’re just starting to pull some numbers together for your dream home project, we suggest the following rule-of-thumb when estimating the cost of an American Metal Roof: Estimate 3 to 4 times the cost of a quality installed asphalt roof – and we suggest estimating on the high side. Yes, it sounds expensive, but in the long run, your American Metal Roof will be far less expensive than replacing your asphalt roof every 10 years. It’ll be a lot prettier too! Blueprint Phase – So, you have a set of plans for your project – awesome! One question: are they the final, final, final plans? We have to ask because plans change often in this phase, and even small changes in total roofing area can have a big effect on the final cost of your American Metal Roof. When your plans are final, resources like RoofGenius.com can help you calculate your total roof area from your blueprints. 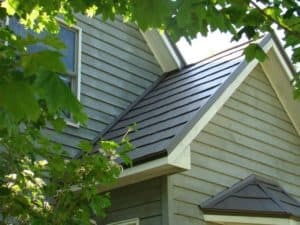 In this phase, we offer a free report that provides a pricing range for the full spectrum of metal roofing options. Fill out the form to the right of this page to easily get started – you’ll need to know the number of squares for your roof so we can calculate estimated cost. Building Phase – Ground is broken – congratulations! If you have selected metal for your new home the steps outlined above will have given you a rough idea of the cost. In this phase we can provide an exact estimate on your roof; when we can use your final plans or we can actually measure the existing structure to create a precise estimate. The estimate will be created as part of an appointment with one of our sales reps. We’ll discuss all of your roofing options and help you select the product that’s best for you. Call 844-638-2576 to set your appointment! In addition, we offer a Do-It-Yourself option that option that will save you up half the cost of an installed roof. We offer hands-on training, video support and we can even lend you one of our professional installers for a day. The DIY option also allows for flexibility in the installation timeline – flexibility that can prove invaluable as you go thru the complex home building process. Learn more and register for an upcoming class at our Do-It-Yourself page.